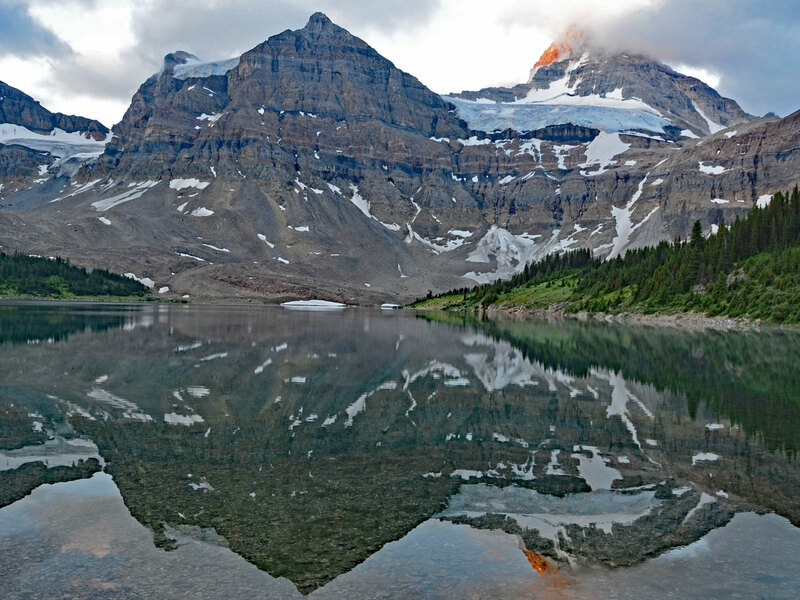 Hiking from Sunshine Ski resort to Assiniboine Provincial Park is a bucket list trek. This backpack is incredible, and the scenery in Assiniboine is absolutely jaw-dropping. Hike from Sunshine Ski resort past wonderful Rock Isle Lake, over Citadel Pass and then down to Assiniboine Park. Once at Assiniboine make Lake Magog your base and explore this exquisite location. Hike out via Wonder Pass and Bryan Creek to the Mount Shark trailhead. 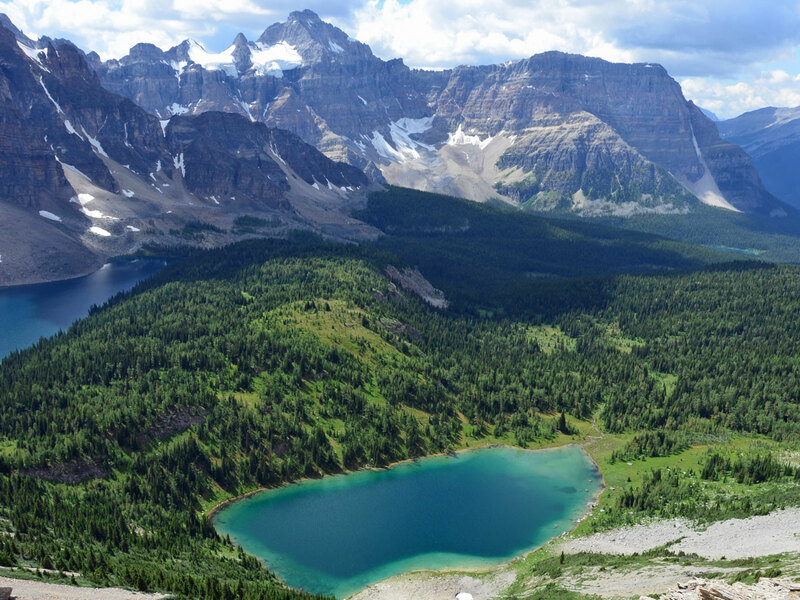 Drive 7.7km west of Banff on Trans-Canada Highway and take the Sunshine Village exit. Drive 8.2km on this lovely road to Sunshine Village ski resort. Pick up your bus or gondola ticket from the main building. 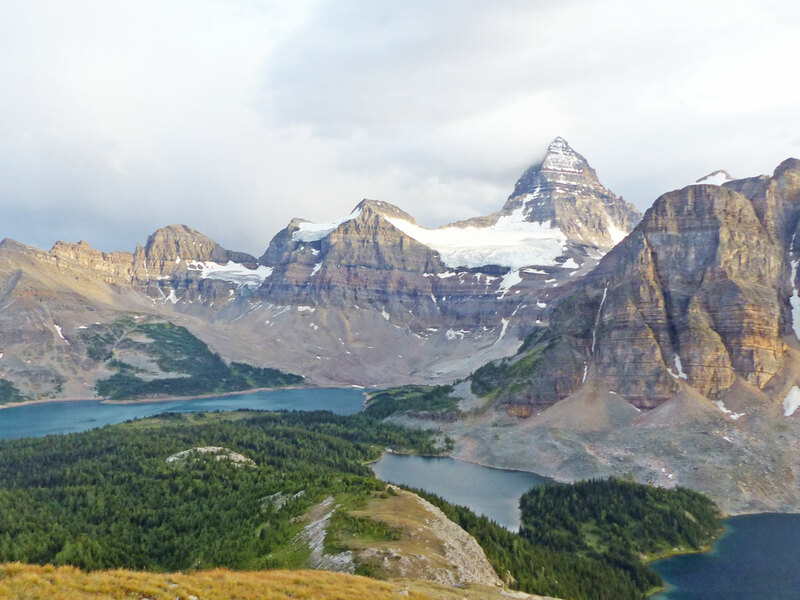 Now that there is the Mount Assiniboine Shuttle, you no longer need to drive one car to Mount Shark and another to Sunshine. 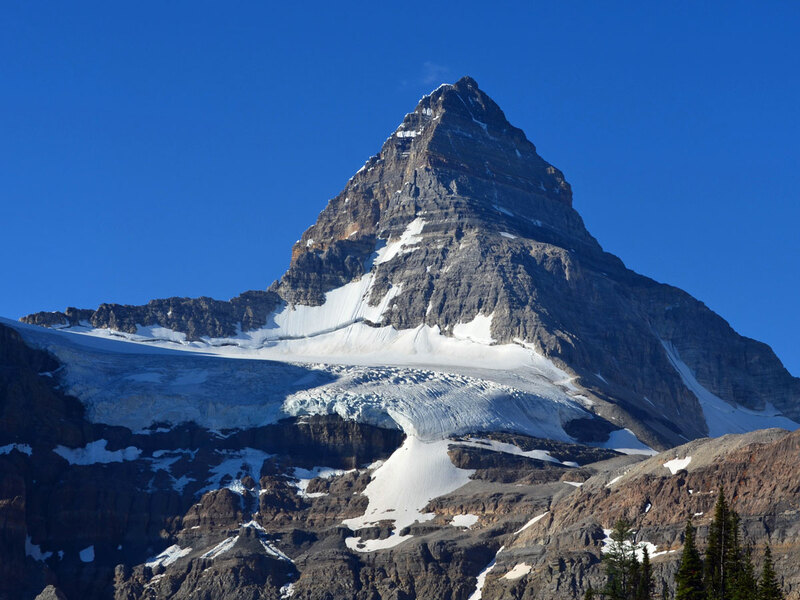 The Mount Assiniboine Shuttle takes you from Mount Shark back to Canmore or Sunshine Village at 4:30pm each day. Definitely book this in advance to ensure it’s running and there’s space for you! With the shuttle, your first day is as easy as driving to Sunshine Village Ski Resort and taking the Gondola or bus up to the base. Book your trip well in advance to ensure you get a seat on the gondola or bus. For a great experience consider staying at Sunshine Mountain Lodge the night before. It’s an unforgettable experience to have the entire mountain to yourself, and a dusk or dawn trip to Rock Isle Lake is spectacular. Staying at Sunshine Mountain Lodge also allows you to get an early start the next day. Also note that the total distance quoted is simply the backpacking route from Sunshine to Mount Shark. You’ll need to add on distance depending on how many days you spend exploring around Assiniboine. This first day gives you four options. Speed demons can do the entire 30.0km route to Lake Magog in one-day. This is a long day, and tiring. Go slower, and camp at Og Lake Campground, a 22.0km hike with 750m up and 885m descent. Still a big day, but achievable if you’re in good shape. Og Lake has 10 campsites and can be booked on the BC Park Camping Website. This is our preferred option, but it’s still a long hike. Do a half-day hike and stay at Porcupine Campground (12.5km). As of 2018 this is a first-come, first served basis, with no reservation fee. If you can’t start until after work, consider getting the last gondola or bus up Sunshine (6pm) and stay at Howard Douglas Lake. This campground is only 5.7km from Sunshine ski resort, however it gets you another night in the backcountry and shortens the next day. From Sunshine, head out on the Citadel Pass / Rock Isle Lake trail uphill to the Southeast, where you soon pass the meadows of the Great Divide. At this point you are on the popular path to Rock Isle Lake, which has one of the most spectacular views in the Canadian Rockies. After hiking about 20 minutes you come to a junction. If you have time, go right first and head for a look at Rock Isle Lake. It will only take you an extra 10 minutes to get there and it’s beautiful. If you don’t have time, then go left and head out to Citadel Pass. The route is clear as you pass below Quartz Hill and then down to Howard Douglas Lake (5.7km). Howard Douglas Lake Campground (SU8) has 5 sites and is worth a visit for an easy backpacking trip. We sometimes stay here if we start late. You can also fill your bottles here as it’s dry for the next 15.0km. From Howard Douglas Lake it’s 3.5km to Citadel Pass. The view from Citadel Pass is stunning and is a fine day hike in itself. From Citadel Pass, the path continues for roughly 13.0km to Og Lake Campground. Continue on the trail from Citadel Pass. 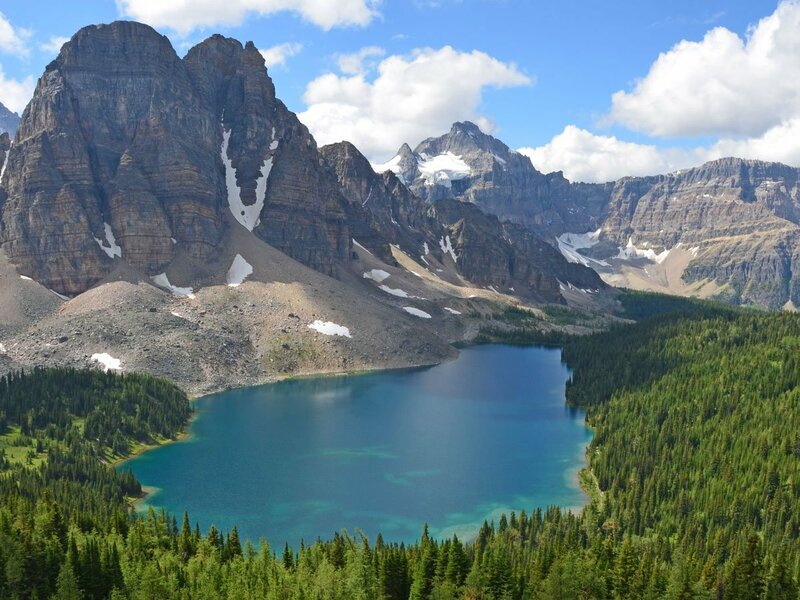 It starts with a steep descent down to the base of Citadel Pass, which is also the border between Banff National Park and Assiniboine Provincial Park. There’s a turn-off here for Porcupine campground, which is 12.5km from Sunshine. The turn-off is to your right and the campground is about 1.0km from the main path. Consider Porcupine if you don’t want a long first day. We prefer to push a long-day to Og Lake or start late and stay at Howard Douglas Lake. From the base of Citadel Pass, where you have entered Assiniboine Provincial Park, follow the main path across a steep open hillside. Over the next 10.0km you will pass some interesting rock formations before arriving at Og Lake Campground. You book your Og Lake campsite online, and it gets booked out early. The campground is located at the North End of Og Lake, and has 7 tent pads, an outhouse, a central cooking area and food storage lockers. Take your water from Og Lake and treat it before drinking it. From Og Lake, the walk to Magog Lake is a short one, only 6.5km, with 150m of elevation gain. We like to get to Magog Lake early as it gives us the best choice of campsites. Magog Lake is a well-appointed campground which is very popular.  You can book your Magog Lake campsite online, and it gets booked out early. Magog Lake has 40 tent pads, a semi-enclosed cooking shelter, food storage lockers, water taps and outhouses. We highly recommend heading over to Assiniboine Lodge between 4-5pm for afternoon tea. Nub Peak (mentioned above): The hike up Nub Peak is about 11.0km, gaining 575m along the way. Sunburst, Cerulean & Elizabeth Lakes: This 4.5km loop is an easy day trip, and spending time lounging by the lakes can be very pleasant. Wonder Pass: This is another sublime hike, and though you’ll likely backpack out via Wonder Pass, it’s great to hike up here and spend a few hours relaxing in the sunshine. It’s about 5.5km each way, with only 230m of elevation gain. There are also numerous scrambles in the area, all of which get to incredible views. Whether you only spent a day in Assiniboine or a week, when it’s time to leave you can either hike out or chopper out. Taking a helicopter is a wonderful experience, with great views and a relief for tired legs. You’ll need to book your helicopter in advance with Assiniboine Lodge. Most people hike out, especially if they are taking the shuttle bus back to Sunshine Village at 4:30pm. 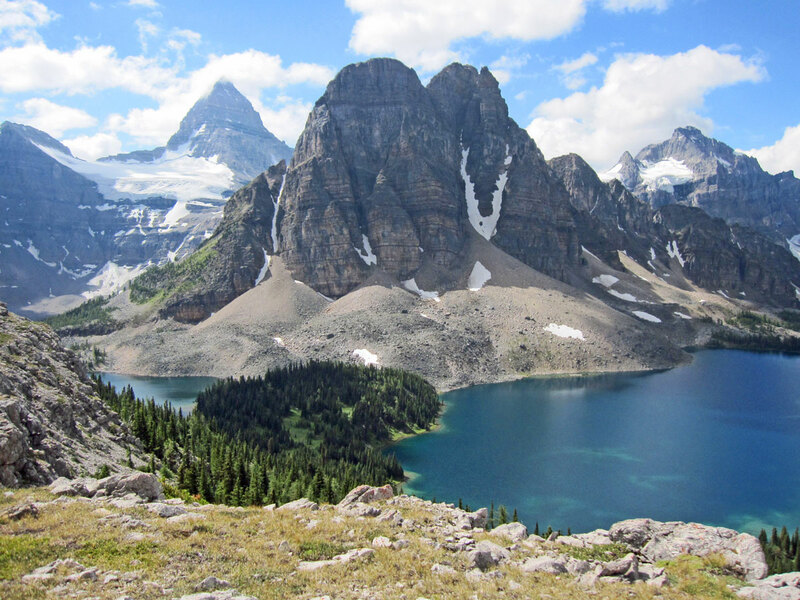 So, if you’re hiking out you can either hike out via Assiniboine Pass and Bryant Creek, or take one more exceptional trip and hike out via the challenging Wonder Pass and Bryant Creek. Heading out via Wonder Pass is a real treat, and highly recommended. 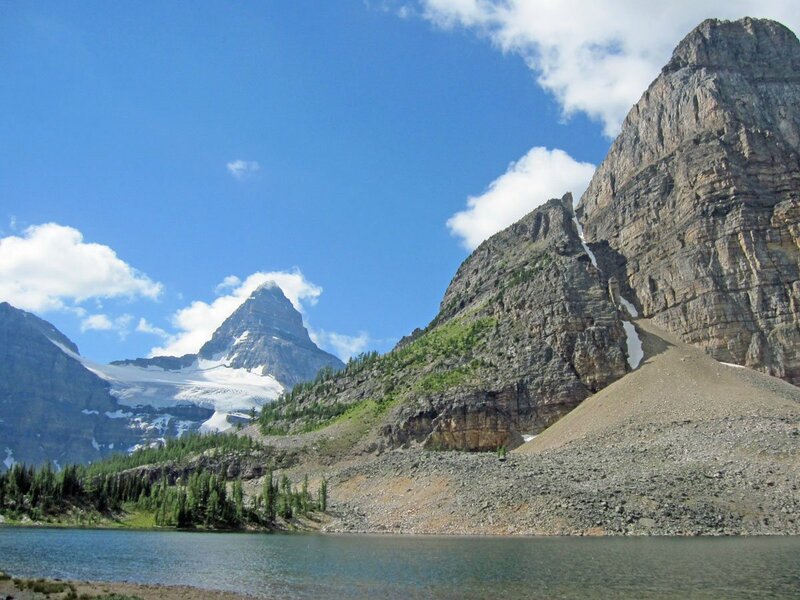 To hike out via Wonder pass, head to Assiniboine Lodge and then hike past the Naiset Huts and along Gog Creek. 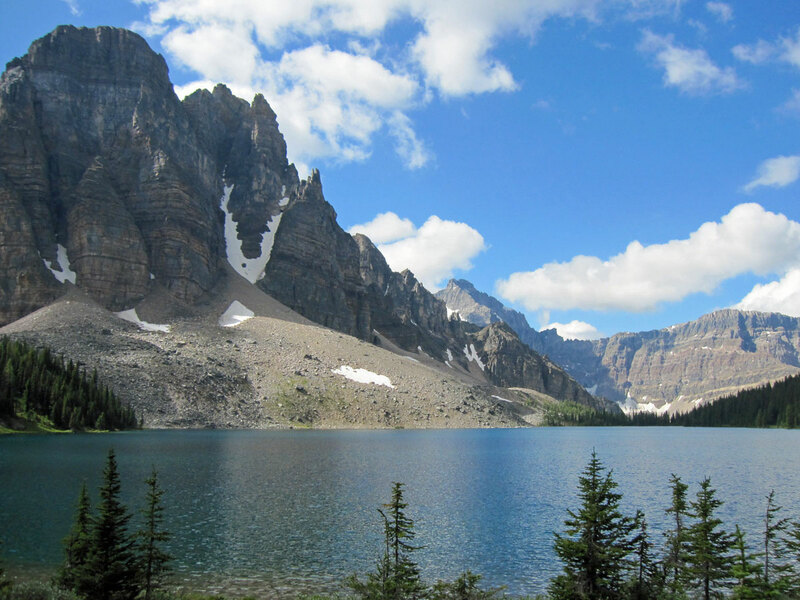 You’ll reach Wonder Pass approximately 3.0km after Assiniboine Lodge, passing by Gog Lake and going through pretty larch forests along the way. The final stretch up Wonder Pass is spectacular in early summer, filled with wildflowers and expansive views looking back. In fact, on clear days you can see the route you hiked in a few days ago along the Og Valley and even Citadel Pass. At Wonder Pass continue on the path as it curves, and you pass into Banff National Park. You soon see Marvel Lake as you descend on a series of switchbacks. As you come to the Marvel Pass Junction (roughly 6.0km) keep left as the trail passes through forest and avalanche paths above the stunning Marvel Lake. Continue on the trail as it re-enters the forest at the end of Marvel Lake and continue straight when the path splits, crossing Bryant Creek and then reaching the main Assiniboine Pass / Bryant Creek Trail (9km from Wonder Pass). Turn right here, and you’ll soon pass the beautiful Bryant Creek Warden’s Cabin. For those that don’t want a 26.0km+ hike out in one day, there are three sleeping options near the Warden’s Cabin. McBride’s Camp (BR14) is the closest campground to the Warden’s Cabin. Further along is the Bryant Creek Shelter. This is a spartan shelter, with nothing but a wood stove, wood and a building. It’s wonderful if it rains and during the winter, but on nice days it’s probably better to camp. Finally, Marvel Lake Campground (BR13) is also nearby. All can be reserved on the Parks Canada Website. Now that you’re on the main Bryant Creek Trail the route back to Mount Shark is clear, on a well-maintained, broad path. The path from here on is unfortunately pretty bland, with only a few views as you go through the forest. Along the way you will see trails fork off, however keep going straight towards Mount Shark trailhead. Eventually you reach trails that may be familiar to you if you do a lot of skiing in the Mount Shark area. You cross over a bridge and reach an arm of the Spray Lakes Reservoir. While you’re only 6.0km from the parking lot, you now have a long uphill on a broad path to finish off your day. Pass Watridge Lake turnoff after 30-45 minutes and follow the logging roads and the abundant signing to Mount Shark Trailhead. Once you get there you’ll probably be pretty tired. One last thing, if you took the helicopter in and need to go to your car at the heliport, then you have an extra 20-30 minute uphill hike from here. This can be very painful! If you haven’t been to Sunshine in summer before, take the chairlift up Mount Standish and walk down to Rock Isle Lake and then come back to meet the trail onwards to Assiniboine. The views on the hike down from Mount Standish are spectacular. Better yet, book a night at Sunshine Mountain Lodge the night before and explore the area without a heavy pack. Book your gondola ticket and shuttle from Shark to Sunshine well in advance. If you’re using the shuttle at Mount Shark Trailhead, you’ll want to leave very early in the morning. Depending on your fitness you may want to be on the trail by 7am as it’s a 7-9 hour hike. You can also helicopter in and out of Assiniboine from Mount Shark. The cost is $175 each way + $3 / pound for excess gear and the helicopter only runs on select days. This is useful if you only want to explore Assiniboine. Book your tickets through Assiniboine Lodge. There are two other accommodation types at Assiniboine. The historic and incredible Assiniboine Lodge is a bucket-list place to stay. It is truly spectacular in summer, but highly in demand, so you usually need to reserve the year before. Reservations for next year start in August the prior year. The nearby Naiset Huts are also good options, and much cheaper. They can feel a bit cramped, but the common cooking facility is incredible. You book them through Assiniboine Lodge as well.